Some weeks ago, on one of the social-media groups to which I belong, a photograph was posted of a short section of surviving railway track from the once-vast system at the former Royal Ordnance Factory in Bridgend. A few days later I went to see and photograph this section and my photo shown here was taken on 3rd May 2015 and is probably the only surviving piece of track still in situ. This set my thoughts to wondering about the railway and how large a system it was, so commenced a little research by consulting old maps. I’m not going to delve into the history of the site, that is well documented in books (1) (2) and on-line sources (1) (2) (3) but briefly the factory covering three large sites was opened in 1940. 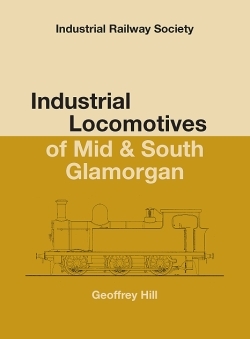 To operate the sites some 24 miles of railway line were constructed to standard gauge and a fleet of one steam locomotive and up to seven diesel-engined Fowler locomotives operated at the main depot at Waterton and a further two Fowlers at Brackla Hill depot. A look at the Ordnance Survey map of the 1950s shows an extensive system in place at Waterton and here I have attempted to show the full extent of the railways extant in 1951. Click on the maps to enlarge in a new window. As the Waterton site is spread across the intersection of four seperate 6″ OS maps, I have joined each section but unfortunately they don’t line up very accurately. I have then overlaid in red the single-track working to make it stand out more clearly and shown double track working in yellow. 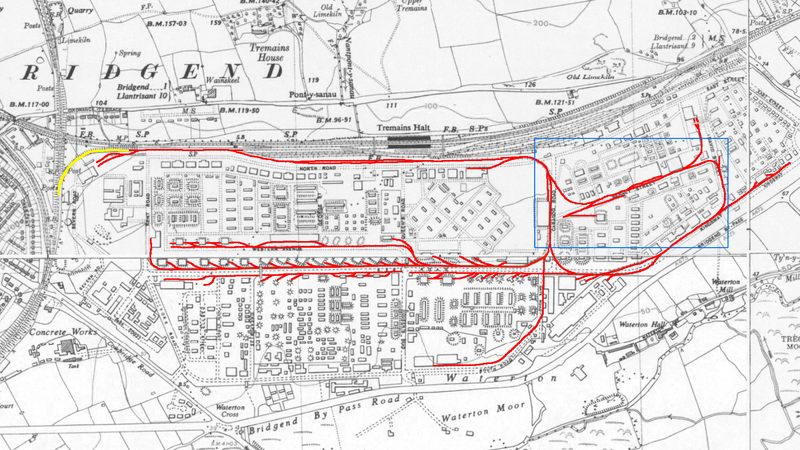 I have not highlighted the extensive sidings off the GWR mainline. 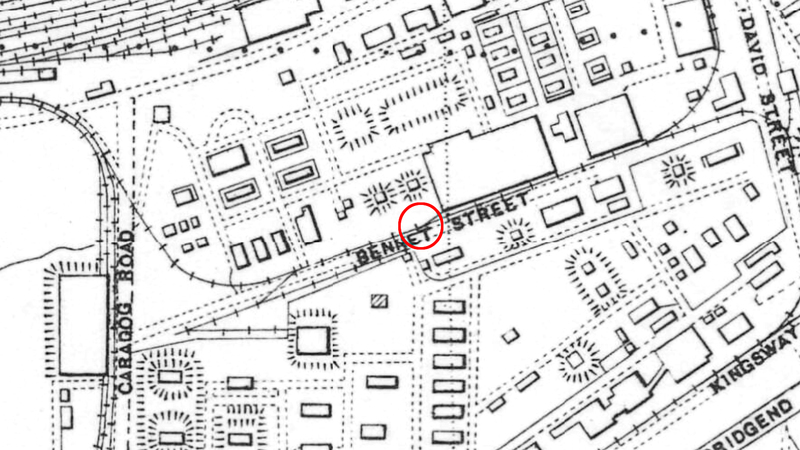 The section within the blue box is reproduced larger below to show the exact position of the remaining portion of railway line and this is circled in red.